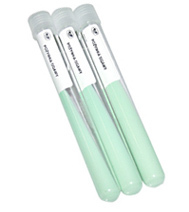 The Ogawa medium is a semi-synthetic, selective medium applied for culture BCG bacteria. Used for determination of active BCG cells amount in anti-tuberculosis BSG vaccine and in BCG suspended matter for immunotherapy. Medium provided as a green-coloured slant. Obtained from egg yolk mass combined with aqueous salt solution and glycerol, as well as aqueous malachite green solution acting as bacteriostatic agent for other microorganisms. Medium controlled for sterility and fertility, does not contain any harmful substances.